Taking a gamble on the quality of a sunrise paid off in spades recently when I returned to the area of the James River where I shot “Promise of a New Day.” I wasn’t sure if the clouds on the eastern horizon would block out the sun, but as you can see from this image, there was just enough of a break in the clouds to allow the rising sun to light up the lowest parts of the clouds. The gamble in question was due to the uncertain nature of weather expected that morning. Knowing that I needed to be in Richmond, I started checking various weather apps and cloud cover simulator apps the day before. It wasn’t sure as to whether the clouds would be far enough east to block the sunrise or not, but the chances were good enough for me to go for it. To get to this location in time, I had to wake up at 3:30 AM and travel 2 hours in icy conditions. The rock I was standing on was very icy and slippery and I must say that as happy as I am with this image, I’m even happier that I didn’t lose any equipment sliding off the rock and into the water. The light didn’t last very long either; shortly after completing the work to take this image, a “roll cloud” passed overhead and completely changed the character of the clouds that remained behind. A roll cloud is a type of shelf cloud (a long tubular-shaped cloud) that spins along its horizontal axis as it moves across the sky. Normally, these can be associated with major storm systems, but this one was apparently just a product of temperature and wind changes. It was amazing to witness in person, but after it passed over, the remaining clouds blotted out the sun and the brilliant sunrise was over. This image is a collage made up of 27 images (3 rows of 9 images each), taken with the Fuji GFX digital camera and the Fuji GF 63mm f/2.8 lens. All images were 2.5 seconds @ f/32, ISO 400. A 3-stop soft-edge neutral density filter was used to bring down the brightness of the sky. I normally assemble my collage images using Adobe Lightroom, but using that system resulted in issues with some areas of the river not quite lining up. So for this image, I exported all the individual images to Adobe Photoshop and experimented with the more complex settings for merging panorama images that exist in that program until I came up with a version that was close enough for me to correct any remaining issues by hand. 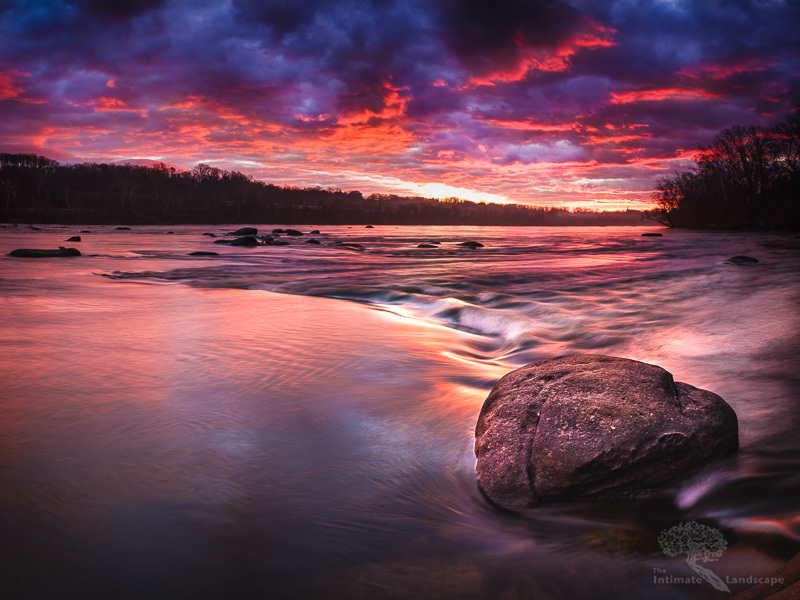 This entry was posted in James River, Landscape Photography and tagged clouds, color, James River, nature, Rocks, Sunrise, Trees, water.